REGISTRATIONS for the Croatia Trophy Italian Experience 2019 are OPEN! The race is international and is open to Italian and foreign crews. The winner of both categories will receive a free entry to the Croatia Trophy 2019. Subscribers by January 15, 2019 will be entitled to a 10% discount. The perfect race to test car and crew before the Croatia Trophy! These words have been described, by most of the participants, the Italian race, organized by Friuli Fuoristrada, which is a prelude to the legendary Croatia Trophy. 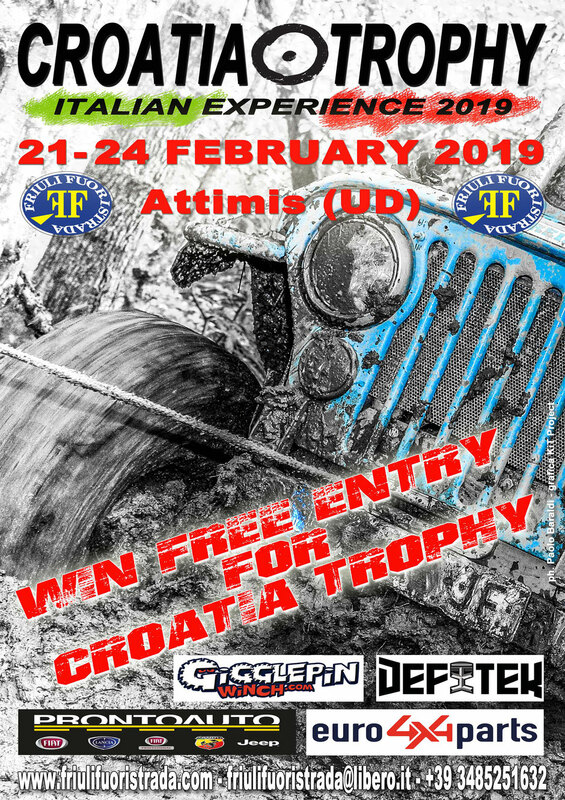 The winner of both categories will receive a free entry to the Croatia Trophy 2019. Which best chance to get a free entry to the Croatia Trophy and get in challenge with the best European teams. Friuli Fuoristrada is pleased to announce the dates of the 3rd edition of Croatia Trophy Italian Experience. The event takes place from 21 to 24 February 2019 in the huge area of the former powder of Attimis (Udine - Italy ). The morphology of the terrain is ideal for this type of competition and it represents the essence of the true Croatia Trophy. Igor BOŽIKOVIĆ, organizer of Croatia Trophy, he enjoyed the competition field and the organization of the Friuli Fuoristrada. The purpose of the Croatia Trophy Italian Experience is to promote and encourage participation in the Croatia Trophy 2019 between Italians crews than among Europeans. Croatia Trophy Italian Experience 2019 is organized by Friuli Fuoristrada in close contact with Igor BOŽIKOVIĆ, Croatia Trophy, which supports and sponsors this race. The race will take place within the powder keg of Attimis; the track will be different depending on the category and the way the race will follow the procedures of the Croatia Trophy. Croatia Trophy Italian Experience 2019 is open to all Italian and not teams. Friuli Fuoristrada thanks from now all the teams participating in the Croatia Trophy Italian Experience 2019, Igor BOŽIKOVIĆ and all the staff of the Croatia Trophy, sponsors and partners, and the media will follow the event. Registrations are open from 6 December 2018. The registration fee is 500.00 euros. Subscribers by January 15, 2019 are entitled to a 10% discount. Each crew must consist of two people (pilot and co-pilot). Each crew member must have a valid driving license, must also be in possession of the UISP B1 card and they will be free to exchange roles during the race. There's 2 categories: "Trophy" class and in the "Adventure" class, the class difference is in the vehicle's equipment. Vehicles with a tare weight higher than 3.5 t are not allowed. For vehicles in the Adventure class only the front winch is required and portal axles are forbidden, the Trophy class cars must be equipped with both the front and rear winches and may have portal axles. For both categories tractor tires and tires with chains are not allowed, the tire size is free for both categories. The winch cables must be new or in very good condition with a hook that is safe and unopened. In addition you can have water, food, and personal effects, tools and spare parts for repairs on board. For this event it is not mandatory to have the vehicle licensed and secured.